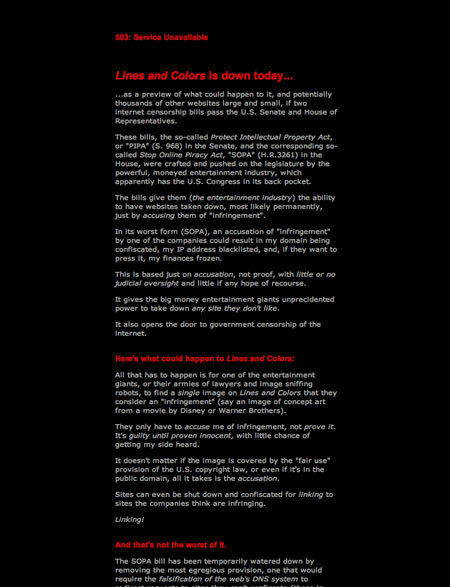 If you stopped by Lines and Colors yesterday, January 18, you may have noticed that Lines and Colors had gone dark, along with a significant number of other sites, in protest, and to raise awareness of the “anti-piracy” internet censorship bills looming in the U.S. Congress. If you didn’t happen to stop by yesterday, but would like to know more about why it matters, what I had to say about the issue, and why the continued existence of Lines and Colors and websites like it hinges on the defeat of these bills, here is the page that was up in place of the site yesterday. The effort to raise awareness of this issue across the web has apparently begun to have an effect, as a number of legislators have withdrawn their support for the bills, at least in their current form. But the fight is far from over; the hugely powerful and influential lobbies that represent the entertainment industry will not slink quietly away and call it a day; they will continue to pressure congress to give them the kind of extraordinary and frightening control over internet content that these bills provide. Those in other countries may feel this doesn’t affect them (it will if hundreds or thousands of websites go dark at the whim of the big corporations), or you may feel frustrated that you can’t affect it directly. Right now, the spread of information and awareness is important, and those of you in Europe and elsewhere will soon enough have your own fight on your hands over similar legislation that these companies are trying to force into law around the world. Those in the U.S. can directly affect the immediate danger of these bills passing by calling or writing your U.S. senators and representatives and urging them to reject the bills. Here is a site called Stop American Censorship that has more information on how easy it is to do that. I’m not exaggerating when I say that if these bills pass, Lines and Colors, and significant other portions of the web, will cease to exist. Thought of You (also on Vimeo) is a short animation by professional animator, storyboard and concept artist Ryan Woodward. It is a simple but beautifully done dance sequence, with suggestions of a story, but open ended enough for viewers to make their own interpretations. Elegantly animated, the sequence is set to World Spins Madly On by The Weepies. What I find particularly enjoyable is the way the characters are drawn as gestural figures, as though from quick life studies, or the kind of construction line drawings used by those who must invent the figure from imagination, like storyboard artists, illustrators and comics artists. I also admire the way he has used variations in finish or solidity of the figures to evoke degrees of presence. In addition to his own site, which includes examples of his illustrations, storyboards and animatics, as well as other short films, Woodward has created a site for Thought of You and similar experiments called Conté Animated, referring in part to his years of teaching gesture drawing, a history that informs every frame of Thought of You. Bill Perkins has worked as a concept artist, production designer, layout artist, art director and storyboard artist for companies like Walt Disney Feature Animation, Warner Brothers, Dreamworks, ILM, and 9th Ray Studios. His film credits include The Little Mermaid, Beauty and the Beast, Aladdin, Fantasia 2000, Space Jam, Shrek, and the upcoming John Carter and the Princess of Mars and The Spiderwick Chronicles. In 2001 he formed High St. Studio as a preproduction and design studio for films, television and the gaming industry. 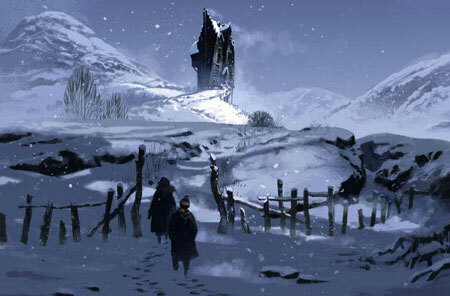 The galleries on the site include some of his beautiful concept art for these features and other projects. His drawings and color renderings are filled with wonderful suggestions of detail, luxurious textures, and a striking use of color and theatrical lighting. Perkins has the kind of loose, fluid drawing style that can only be founded on the confidence of solid draftsmanship. There is a gallery on his site of “Continuity Guides”, something rarely posted, even by concept artists. These offer a fascinating glimpse into the concerns for consistency and design clarity that are important to the art of visual storytelling, animated and otherwise. The world that characters inhabit can be as fantastical as the design artists can imagine, but to be effective it must be consistent within itself. The High Street Studio Continuity Guide gallery includes Style Guides, Color Scripts, and Workbooks used as previsualization tools for directors and guides for concept artists to keep them on the same page with the look and feel for a given production. This is a more interesting process than it may sound like on the surface. The first item in that section, for example, is concerned with the design for grasslike plants for a production of GON (which I assume refers to a film adaptation of the Manga dinosaur character), in which a fantasy version of an African veldt-ike environment is being designed. The plant design develops as a combination sketches from real world plants and stylized drawings based on Henri Rousseau’s “primitive” painted plants. 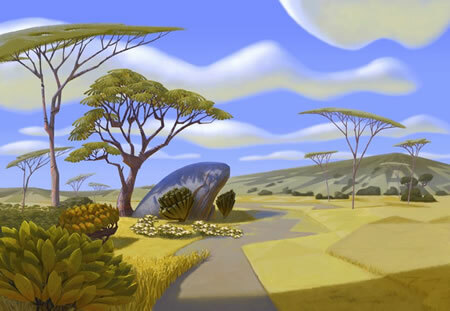 Rousseau is referred to again, along with Cezanne, Escher and other artists, in description of the kind of visual space that can be defined for the characters — “Flat Space”, as exemplified by Rousseau, in which elements are essentially all on the picture plane; “Deep Space”, the traditional two-dimentional projection of three dimensional reality that is the basis for realism; “Limited Space”, a range between the first two, demonstrated in the paintings of Cezanne; and “Ambiguous Space”, as in the deliberately disorienting images of M.C. Escher. There are also continuity guides on ths site for the overall color palette of an animated film, in this case, Tarzan. Just as a painting can have passages of different colors, that must still work together as a whole; so can a visual story, such as a live action or animated film, have passages in which certain colors and moods predominate but must fit into a unified visual feeling for the piece as a whole. The design of basic elements can vary within a story as well, in order to enrich the sense of place. There is a model sheet of tree branches for the animated Tinkerbell, demonstrating how tree branches are to be drawn differently for the backgrounds of scenes in London, Neverland and Pixie Hollow. Perkins’ site also features a section of color and monochrome sketches, including some wonderfully fluid life drawings, and a selection of storyboards. What’s missing, unfortunately, is much information about the artist himself. The very brief bio on Wikipedia indicates that he is currently teaching composition, color, and watercolor at the Los Angeles Academy of Figurative Art. His bio on the LAAFA site tells us that he began his career in gallery art, was one of the co-founders of the Plein-air Artists of California and has been a member of the Plein-air Painters of America since 1985. I wasn’t able to find a dedicated online gallery of Perkins’ plein-air painting, but Michael Hirsh of Articles and Texticles comes through again with a post on Perkins from last year that includes some of his landscape paintings. Unfortunately, I’m late in telling you about an exhibition of Perkins work at the Laguna College of Art and Design that just closed Septemebr 27. Not only do Perkins drawings and paintings, concept designs, model sheets and workbooks offer a fascinating insight into the level of thought and detail that goes into good visual storytelling; the range of influences in his work points out the connections I am always trying to suggest between various genres of visual art that people often assume are distinct and separate from one another. Most people think of comics as simply a series of illustrations, and of the skill involved as essentially one of drawing. What they don’t see is the art underneath, the art of visual storytelling, which in many ways is more important in comics than outright drawing skill. A person with good visual storytelling skills and modest drawing ability can make better comics than someone who is a dazzling artist, but lacks an understanding of visual storytelling principals. An important part of that skill set is a subset dealing with the design and layout of comics panels. Here is a link to a great resource for anyone interested in comics storytelling, or its close relative, movie and animation storyboarding. Mark Kennedy, on his blog devoted to storyboarding, Temple of the Seven Golden Camels, which is itself a great resource, has posted a wonderful 7-page feature called Comic Strip Artist’s Kit, by Disney comic book artist Carson Van Osten. Van Osten went to the Philadelphia College of Art (now the University of the Arts) here in Philadelphia. He was also a musician and played bass in the legendary Philly 60’s bands Woody’s Truck Stop and The Nazz (Todd’s Rundgren’s original band). He later went to work for Disney Studio’s comic book department, writing and drawing Mickey Mouse and Goofy comics for distribution in Europe. He then moved to their American comic strips department, worked with Floyd Gottfredson on the Mickey Mouse daily newspaper strip, became the art director of the department in the 80’s and 90’s and, as far as I know, continues to do work on various Disney comics. 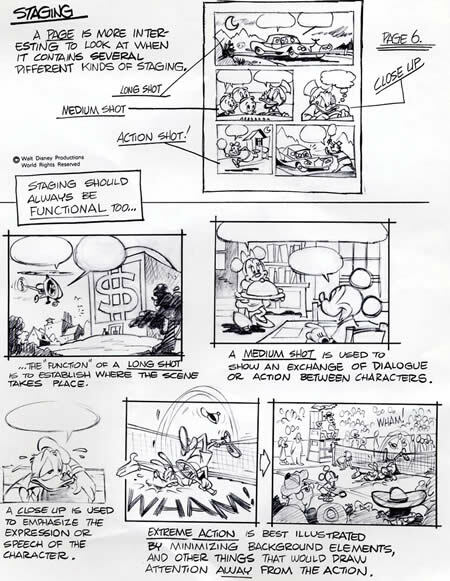 In 1975, as part of a slide presentation for a Disney meeting in Frankfurt, he drew up some sheets on common problems in comics layout and staging. It was so well received that the company printed 2000 copies and distributed it to all Disney offices. The sketches also were used in the book The Illusion of Life: Disney Animation by Ollie Johnston and Frank Thomas. Copies of the sheets, which are a terrific primer on the principles of staging and layout in comics and storyboarding, have generously been made available on the web. Carson saw a mention of the pages on Kennedy’s storyboarding blog and sent him large copies, which he has posted in versions at a high enough resolution to be really usable and printable. Even if you’re not interested in creating comics or storyboards, take a look for a fascinating glimpse into some of the “hidden art” of visual storytelling. Links via Metafilter and Drawn!